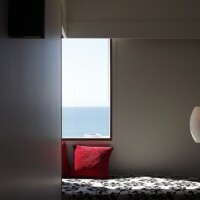 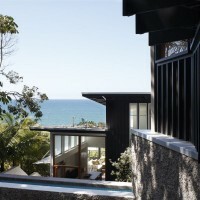 Owen and Vokes Architects have designed the Point Perry Beach House in Queensland, Australia. 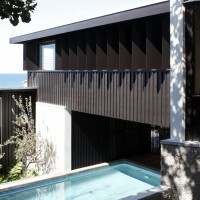 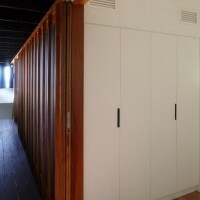 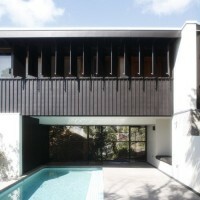 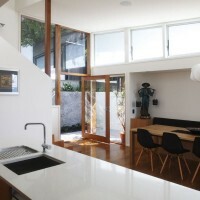 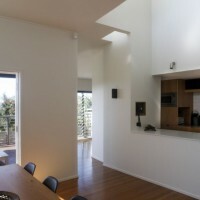 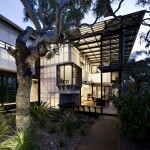 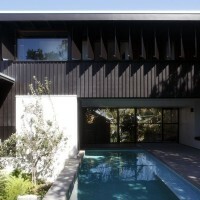 Our client approached us by referral from Lindsay Clare, the original architect of the mid 1990’s beach house. 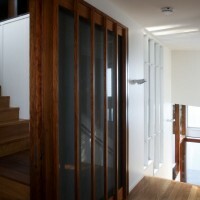 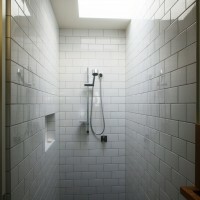 The new owners wished to extend the house whilst preserving the character of the existing house. 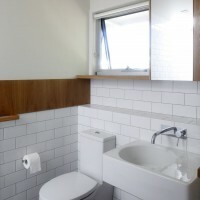 New programme includes additional bedrooms, bathrooms and car accommodation. 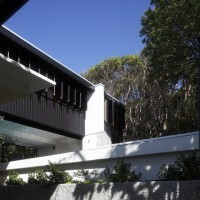 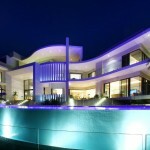 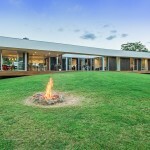 The original fibro beach house appears as indigenous to the steep Coolum Hill site as the scrubby coastal vegetation amassed at the rear of the site. 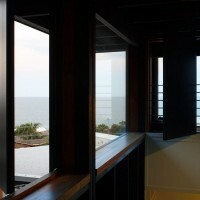 The remnant vegetation is valued as providing a counterpoint to the ocean view – a dense, shaded reprieve from the panorama of sea and sky. 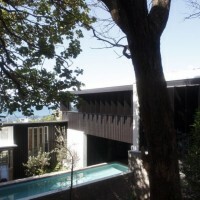 The siting of the extension preserves as much of this existing vegetation as possible, and as a consequence, bridges over an existing pool to occupy the remaining build-able volume on the site as dictated by height controls. 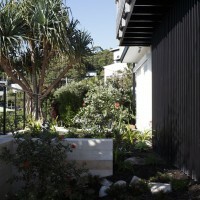 A new courtyard re-orients the entry, connecting living spaces physically to the hillside and providing views to the remnant vegetation beyond. 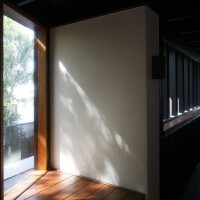 Manipulation of the existing built and natural topography establishes new connections between living spaces and the garden. 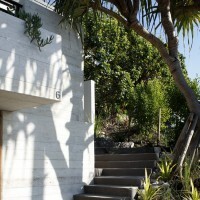 Masonry elements manage levels across the site, forming new landscape spaces and embedding the fibro-clad extension into the hillside. 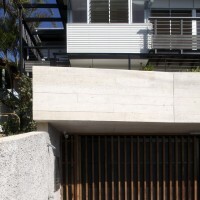 At street level, a concrete bunker accommodates cars on the site, negating the need for a steep driveway and reclaiming space for a garden overlooked from the living spaces and decks above. 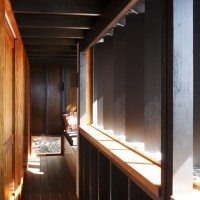 Minor excavation reveals a courtyard space below what was previously a timber pool deck. 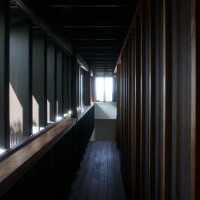 The promenade through the site reveals the nuances of setting and topography. 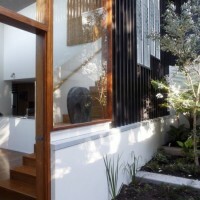 The entry courtyard, positioned at the centre of the site in both the vertical and horizontal plane, is accessed by climbing external stairs from street level. 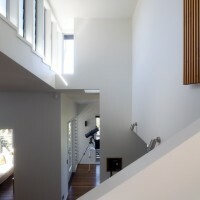 The existing internal stair connects the external circulation route from the street to the open air circulation of the extension. 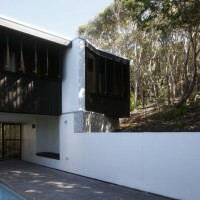 Within the extension, a linear verandah provides access to bedrooms and bathrooms, culminating in a daybed nestled into the fringe of the remnant vegetation.